Intesa Sanpaolo was created on January 1, 2007, through the merger of two Italian banking groups, Banca Intesa and Sanpaolo IMI. The Intesa Sanpaolo brand. 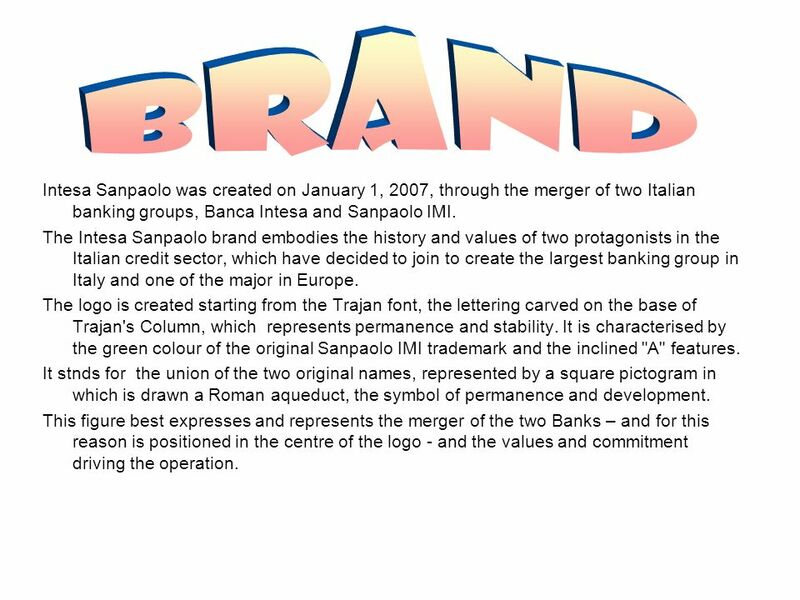 2 Intesa Sanpaolo was created on January 1, 2007, through the merger of two Italian banking groups, Banca Intesa and Sanpaolo IMI. The Intesa Sanpaolo brand embodies the history and values of two protagonists in the Italian credit sector, which have decided to join to create the largest banking group in Italy and one of the major in Europe. The logo is created starting from the Trajan font, the lettering carved on the base of Trajan's Column, which represents permanence and stability. It is characterised by the green colour of the original Sanpaolo IMI trademark and the inclined "A" features. It stnds for the union of the two original names, represented by a square pictogram in which is drawn a Roman aqueduct, the symbol of permanence and development. This figure best expresses and represents the merger of the two Banks – and for this reason is positioned in the centre of the logo - and the values and commitment driving the operation. 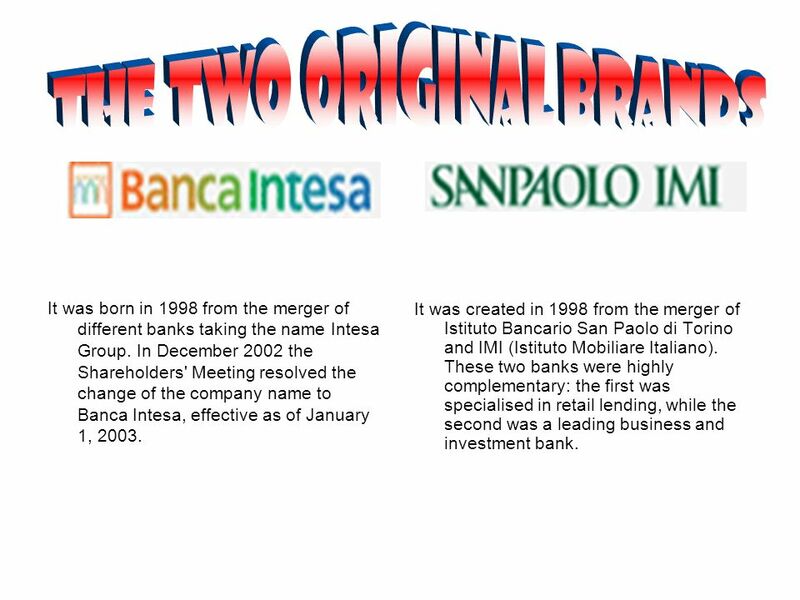 3 It was born in 1998 from the merger of different banks taking the name Intesa Group. 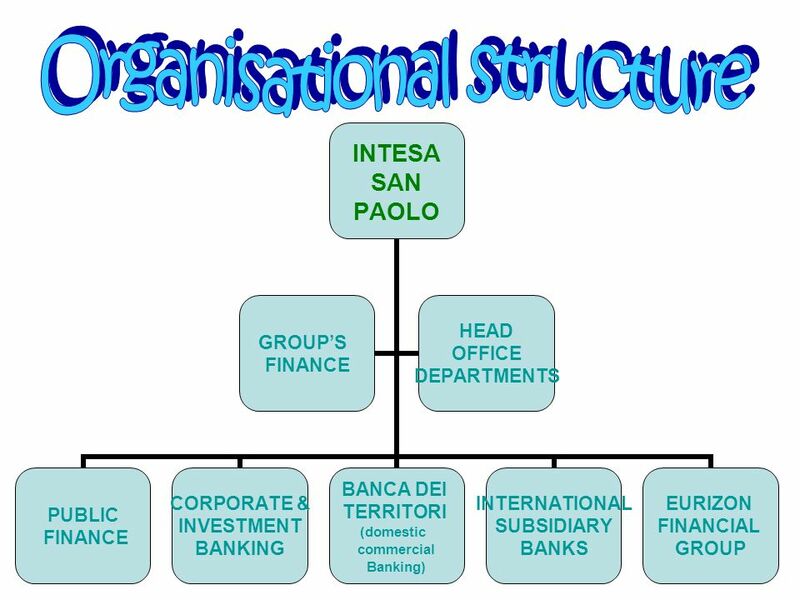 In December 2002 the Shareholders' Meeting resolved the change of the company name to Banca Intesa, effective as of January 1, 2003. 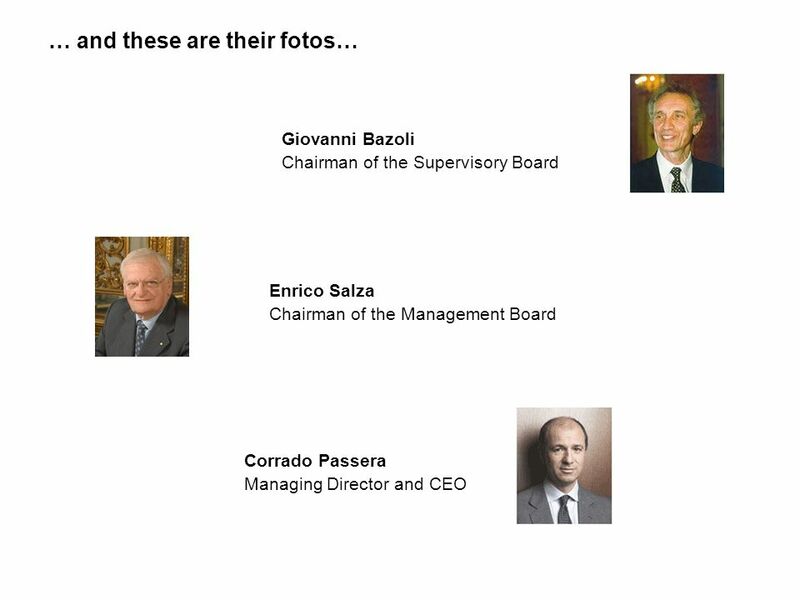 It was created in 1998 from the merger of Istituto Bancario San Paolo di Torino and IMI (Istituto Mobiliare Italiano). These two banks were highly complementary: the first was specialised in retail lending, while the second was a leading business and investment bank. 4 ADVERTISING Everyone knows the advertising of their products. In the beginning it was only of San Paolo IMI and now of both. Its very famous and it represents the best use of advertising based upon irony and fun. These two qualities make it very remarkable and all the people know their services. 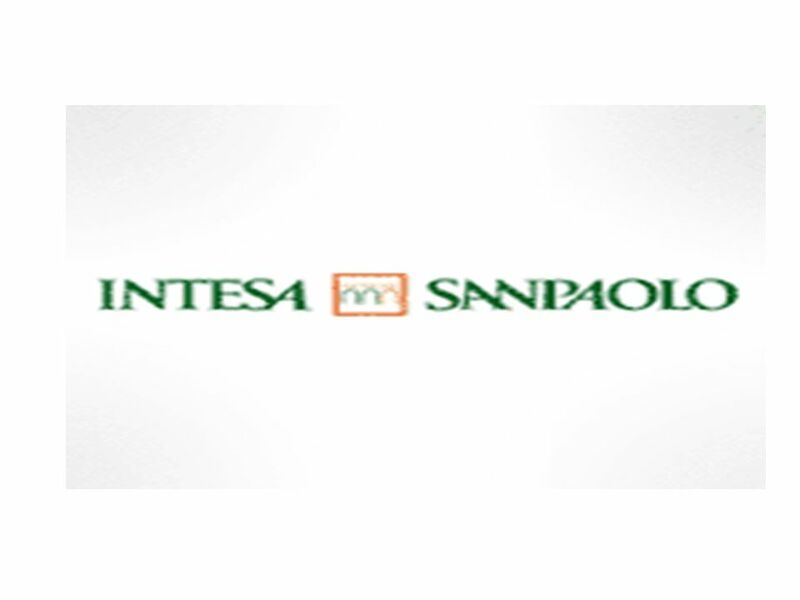 5 Intesa San Paolo has adopted a system based upon administration and control, which provides for supervisory board whose members are appointed by the Shareholders' Meeting and a management board appointed by the Supervisory Board. SUPERVISORY BOARD: it supervises the activity carried out by the Management Board and, in particular, it approves the main strategic initiatives proposed by the Management Board. MANAGEMENT BOARD: appointed by the Supervisory Board, it is responsible for the Group management in accordance with the strategy set by the Supervisory Board. CEO: hes the unique CEO, he is appointed by the Management Board from amongst its members. 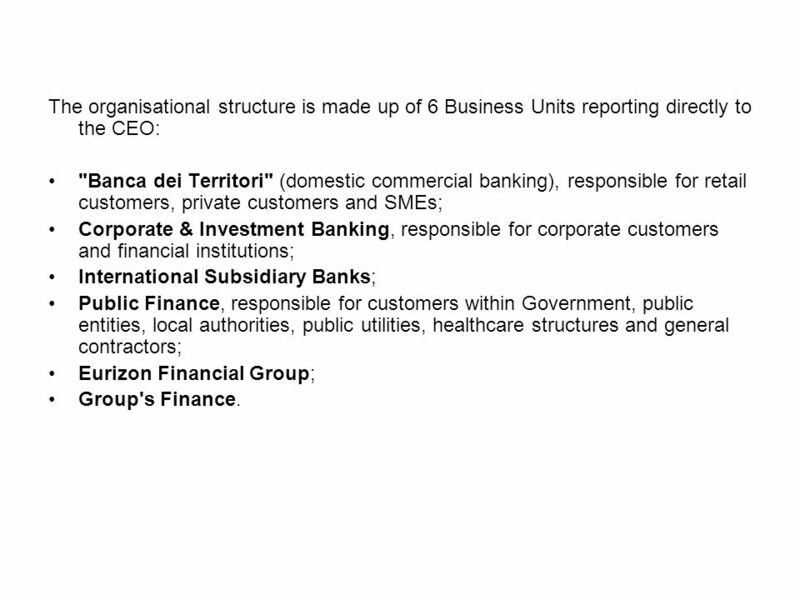 7 The organisational structure is made up of 6 Business Units reporting directly to the CEO: "Banca dei Territori" (domestic commercial banking), responsible for retail customers, private customers and SMEs; Corporate & Investment Banking, responsible for corporate customers and financial institutions; International Subsidiary Banks; Public Finance, responsible for customers within Government, public entities, local authorities, public utilities, healthcare structures and general contractors; Eurizon Financial Group; Group's Finance. 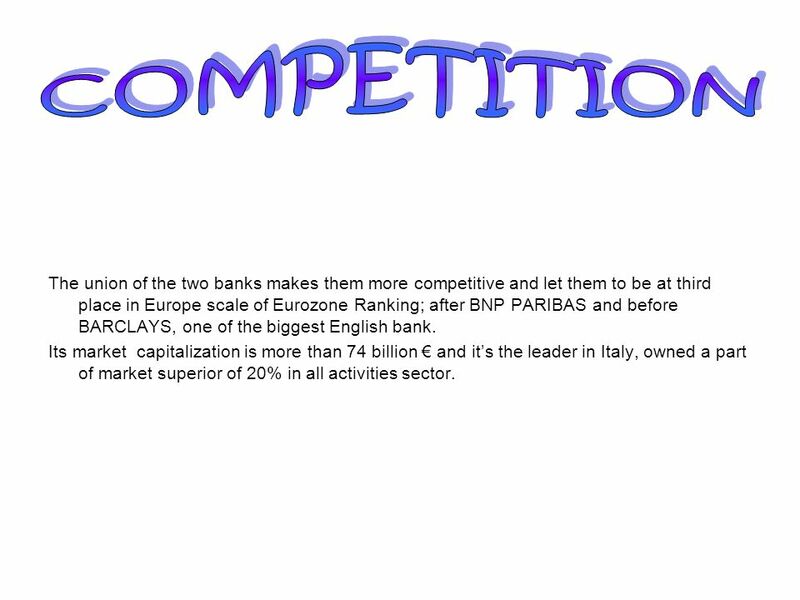 10 The union of the two banks makes them more competitive and let them to be at third place in Europe scale of Eurozone Ranking; after BNP PARIBAS and before BARCLAYS, one of the biggest English bank. Its market capitalization is more than 74 billion and its the leader in Italy, owned a part of market superior of 20% in all activities sector. 11 They offer their primary services to 11 million costumers, having about 6.000 branches. Now, they allow their costumers to open a new account by internet. Its name is ZERO CONTO and it has no costs for the operations made in internet. This account is very practical for people who make lots of operations by pc. In the same time they will have assistance by the branch they indicate in their country. 12 The Group's objective is indeed to produce good results in banking, but just as important as what is achieved is the way in which this is being achieved. It is not merely a question of "how much"; there is also the question of "how". 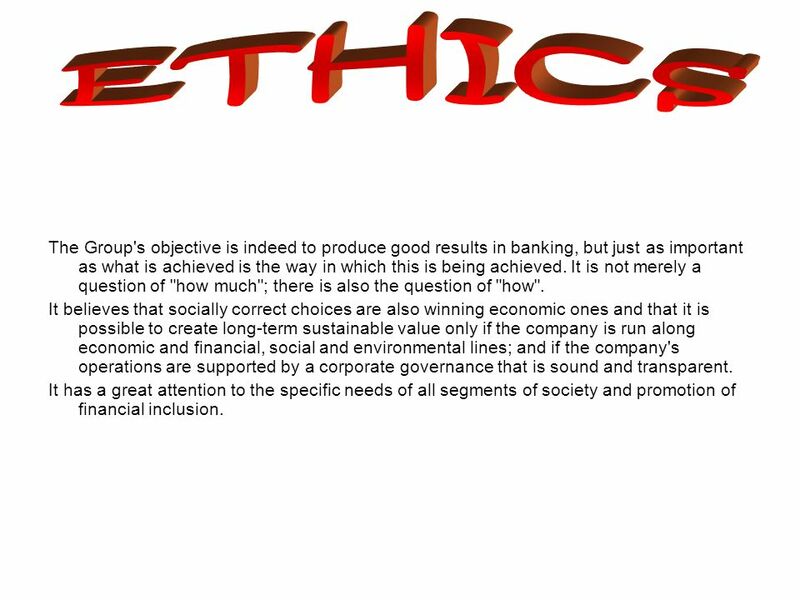 It believes that socially correct choices are also winning economic ones and that it is possible to create long-term sustainable value only if the company is run along economic and financial, social and environmental lines; and if the company's operations are supported by a corporate governance that is sound and transparent. It has a great attention to the specific needs of all segments of society and promotion of financial inclusion. 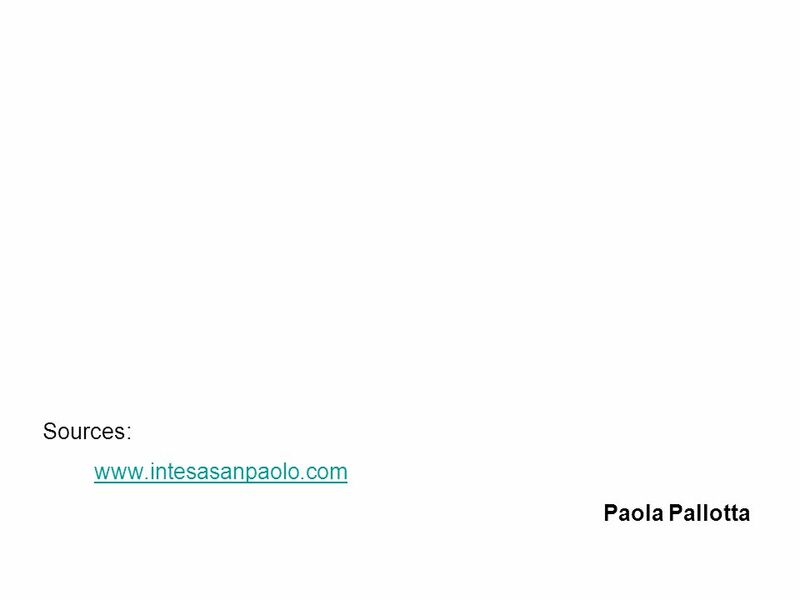 Download ppt "Intesa Sanpaolo was created on January 1, 2007, through the merger of two Italian banking groups, Banca Intesa and Sanpaolo IMI. The Intesa Sanpaolo brand." International currency and financial institutions - The European Bank for Reconstruction and Development and the European Investment Bank Andrea Bolčáková. E UROPEAN C ENTRAL B ANK W ORLD B ANK I NTERNATIONAL M ONETARY FUND E UROPEAN I NVESTMENT B ANK Miroslava Švábová Kristýna Nevolová. Modern Banking in Syria The Role of International Best Practice by Peter Hayward Damascus,2 July 2005. Building a unique, mutual alternative in financial services Mutuals Forum 2009 Neville Richardson Chief Executive - Co-operative Financial Services. 1 The Regulatory Authority for electricity and gas:, The Regulatory Authority for electricity and gas: objectives, tasks, independence, accountability. Supporting Manufacturing in the South West INTRODUCTION. 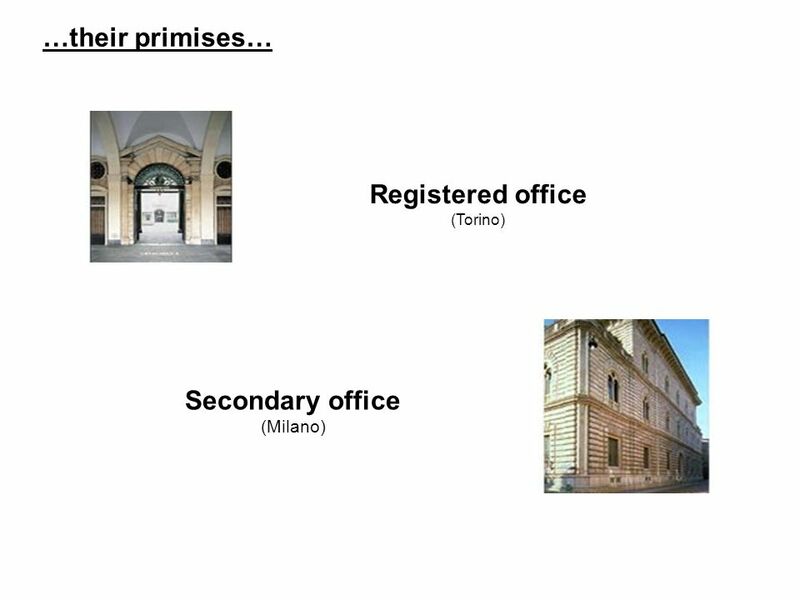 Topic 4: Banking Structures Around the World The United Kingdom and Germany. | ProCredit Bank? The Bank for You1. | German capital The Bank for You German standards and global presence German capital The only German bank in Serbia. Table of contents Executive summary Problem statement  Introduction Introduction  Issue  Problem statement Problem statement Enclosures Problem one.